Dust control is crucial in maintaining the safety, utility, and integrity of unpaved surfaces such as roads, parking lots, construction sites, recreational surfaces, land fills, quarries and farms. MAG® attracts moisture from the air and its surroundings, keeping unpaved surfaces damp, reducing dust. MAG® binds the dust, preserving road stability and lengthening road life. MAG® requires no pre-wetting, simplifying application, reducing cost and providing surfaces with faster protection. MAG® is ideal for recreational surfaces. An excellent tennis court conditioning product, MAG® eliminates the constant need to water or apply other conditioning chemicals. 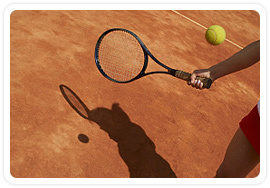 It creates a long-lasting damp surface that provides consistent playing conditions without the negative side effects of other products often used for court conditioning.